All Clad vs Calphalon which stainless steel cookware set should you buy? ​Make no mistake about when it comes to quality cookware sometimes paying more really is worth it. So if you are a new home owner and need to kit out your kitchen or need to replace your current pans should you buy an inferior cookware set that may only last up to five years? Investing in the best quality stainless steel pots and pans from the get go can save you money in the long run. A top notch stainless set should not need to be replaced frequently. Depending on just how well you care for your cookware a really high quality set should last decades. In fact it may never need to be replaced. So those cheaper sets with a limited lifespan are essentially a false economy. If you have decided to take the plunge and truly invest in the best cookware you can afford then there are a few well known brands that have built a solid reputation for quality and durability. ​Both All-﻿Clad and Calphalon​ have established themselves as the go-to brands when it comes to high quality stainless steel cookware. Although between the two it is All-Clad that have really marketed themselves(and priced accordingly) as the premium brand. Is the price difference between All-Clad and Calphalon really worth it though ? The most popular of the All-Clad stainless steel line is the Tri-Ply range. It is this line of cookware that is commonly being referred to when people mention All-Clad cookware. The Tri-Ply range uses All-Clad's triple layer design and in fact it is this design that actually put them on the map. Tri-Ply uses three layers of metal bonded together. At the core of the design is an aluminum layer. The aluminum layer is wrapped in a stainless steel inner layer and on the exterior. This design ensures that the heat applied to the pan is distributed evenly and quickly. The main disadvantages is that it is expensive to make and is quite a complicated process. There are three different All-Clad Stainless Steel Tri-Ply Bonded Cookware sets is available a 5, 10 and a 14. Calphalon have created a range of stainless steel cookware that is pretty similar in design to All-Clad only without the hefty price tag. They too have used a tri-layer metallic design which also has a heavy aluminum core wrapped in two other layers of stainless steel. The exterior has a polished stainless steel finish whilst the inner layer has a more satin like finish. You get the same great heat distribution as per the All-Clad set and the similar cooking performance. Although the Calphalon is not quite as robust as the All-Clad pans in terms of maximum usable temperature, it is rated up to 450 degrees F.
Note that the Calphalon range comes with glass lids unlike the All-Clad​ cookware sets that come with stainless steel lids. There is an 8,10 and 12 piece set available. 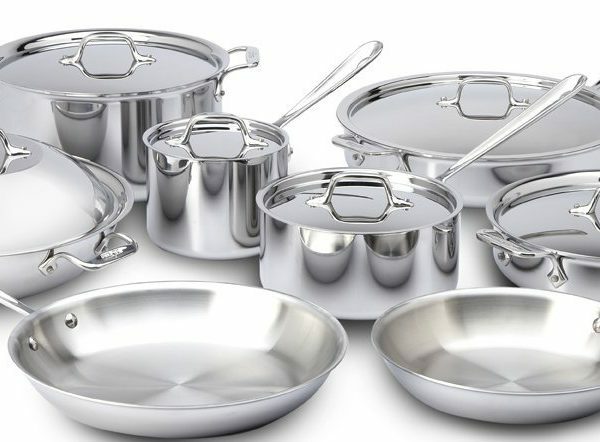 Just what is the difference between All Clad and Calphalon​ cookware sets ? The All-Clad range is the premier tri-layer design and you are paying a little extra for the higher brand recognition and prestige. Performance wise however the All-Clad range is capable of enduring higher temperatures in an oven by an extra 150 degrees over the Calphalon. It also comes with stainless steel lids as apposed to the glass lids of the Calphalon. Calphalon vs All Clad which should you buy? ​One of the stand out differences between both Caphalon and All-Clad are the lids that are supplied with each range. 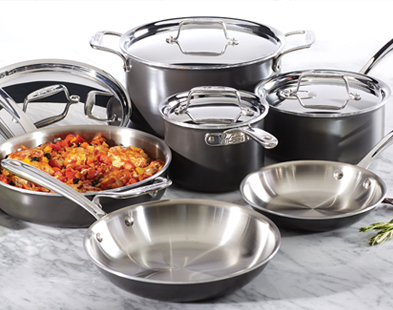 The All Clad range offer almost exclusely stainless steel lids whereas the Calphalon range has glass lids. The other issue is that All-Clad are proudly made in the United States which certainly adds to the higher price tag. Calphalon on the other hand is made in ​both the USA and some of the range in China. Clearly the biggest factor that will influence your decision will be the price at which both sets come in at. 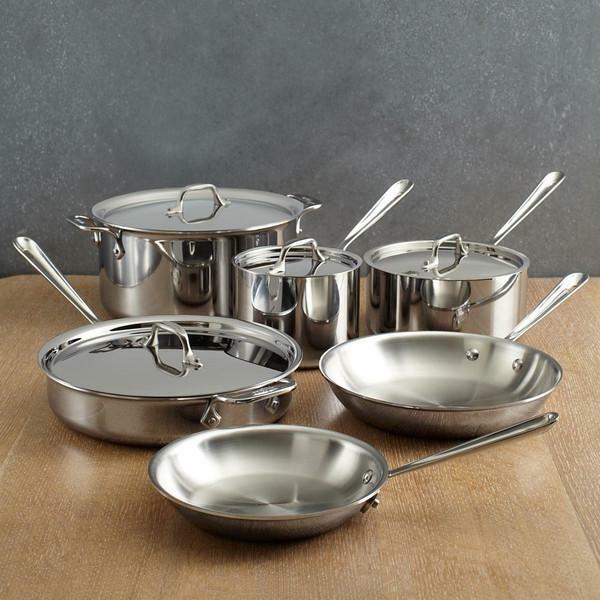 The All-Clad is over double the price of the equivalent set from Calphalon. If you are a professional chef or do a lot of high temperature cooking at home then it is probably best to buy All-Clad​.